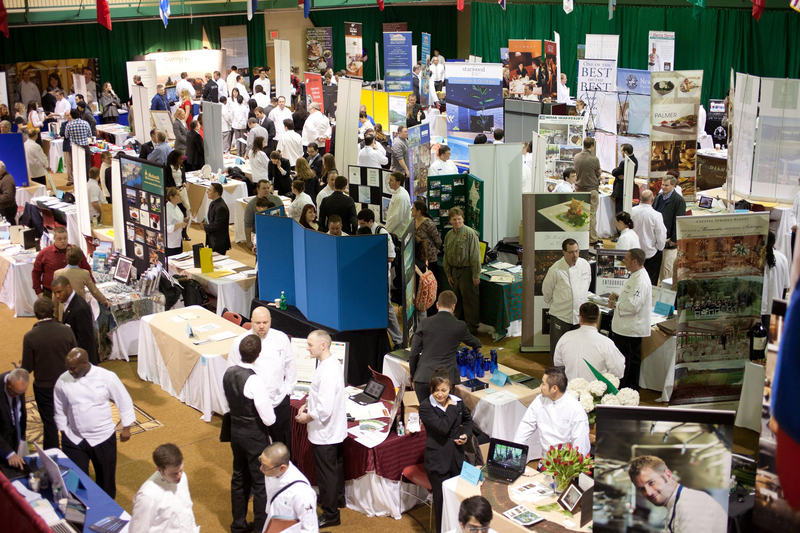 Hyde Park, NY – Career fairs at The Culinary Institute of America continue to set attendance records for recruiters, reflecting both the marketability of the college’s students and the strength of career opportunities in the food world, no matter where the economy stands as a whole. On November 4, there will be 324 recruiters representing 131 different employers at the CIA, actively pursuing recent and soon-to-be graduates. This is one of the largest career fairs ever hosted by the college, attracting even more than the 280 recruiters who came in February 2014. Recruiters represent well-known stand-alone restaurants, restaurant groups, resorts, supermarkets, healthcare facilities, event planners, research & development companies, and many more areas of the foodservice industry. They explain why they come to the CIA to hire for a wide range of positions in kitchens and dining rooms and on management tracks in a short video. More than 700 students and alumni are expected to attend. Among the 23 first-time companies seeking CIA-trained men and women are Dominique Ansel Bakery and the Kessler Collection Hotels, a group of luxury and boutique hotels around the U.S.
After capping the number of recruiters at previous career fairs due to venue space issues, the Student Recreation Center gymnasium and multi-purpose room have been reconfigured to fit more employers. Despite the additional space, there remains a waiting list. Recruiters who could not fit into this event will be first on the list to attend the next career fair in February. In addition to the career fairs on the Hyde Park, NY campus, now held five times a year, the CIA’s California and Texas campuses each held well-attended “Career Networking Days” in October. Founded in 1946, The Culinary Institute of America is an independent, not-for-profit college offering associate and bachelor's degrees with majors in culinary arts, baking and pastry arts, culinary science, and applied food studies, as well as certificate programs in culinary arts and wine and beverage studies. As the world's premier culinary college, the CIA provides thought leadership in the areas of health & wellness, sustainability, and world cuisines & cultures through research and conferences. The CIA has a network of 46,000 alumni that includes industry leaders such as Grant Achatz, Anthony Bourdain, Roy Choi, Cat Cora, Dan Coudreaut, Steve Ells, Charlie Palmer, and Roy Yamaguchi. The CIA also offers courses for professionals and enthusiasts, as well as consulting services in support of innovation for the foodservice and hospitality industry. The college has campuses in Hyde Park, NY; St. Helena, CA; San Antonio, TX; and Singapore.